Seventy years ago, 20 000 women marched to the Union Buildings to petition against laws that required black South Africans to carry the "pass”. National Women’s Day commemorates these heroic women. But it is also an opportunity to draw attention to significant issues that South African women still face, such as domestic violence, sexual harassment in the workplace and unequal pay, amongst other things. 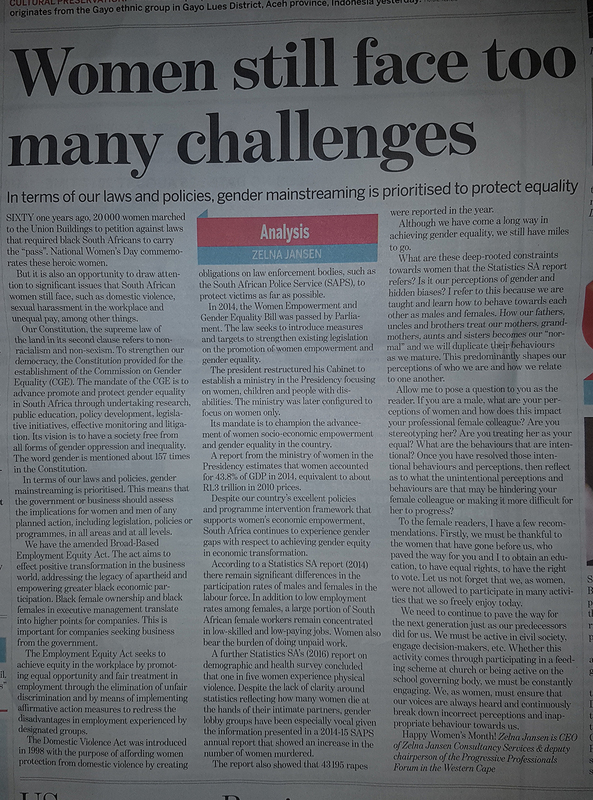 South Africa has made strides in the legislative sphere to address inequality and the challenges faced by women. Our Constitution, the supreme law of the land, at the very outset states that our country is a sovereign democratic state founded on values of human dignity, the achievement of equality, and the advancement of human rights and freedoms. This is the very first clause in the Constitution. The second clause refers to non-racialism and non-sexism. This is followed by the equality clause in section 9 of the Bill of Rights. To strengthen our democracy, the Constitution provided for the establishment of the Commission on Gender Equality (CGE). The mandate of the CGE is to advance promote and protect gender equality in South Africa through undertaking research, public education, policy development, legislative initiatives, effective monitoring and litigation. Its vision is to have a society free from all forms of gender oppression and inequality. The word gender is mentioned about 157 times in the Constitution. In terms of our laws and policies, gender mainstreaming is prioritised. This means that government or business should assess the implications for women and men of any planned action, including legislation, policies or programs, in all areas and at all levels. We have the amended Broad-Based Employment Equity Act. The Act aims to effect positive transformation in the business world, addressing the legacy of apartheid and empowering greater black economic participation. Black female ownership and black females in executive management translate into higher points for companies. This is important for companies seeking business from government. The Employment Equity Act seeks to achieve equity in the workplace by promoting equal opportunity and fair treatment in employment through the elimination of unfair discrimination and by means of implementing affirmative action measures to redress the disadvantages in employment experienced by designated groups. The Domestic Violence Act was introduced in 1998 with the purpose of affording women protection from domestic violence by creating obligations on law enforcement bodies, such as the South African Police Service (SAPS), to protect victims as far as possible. In 2014, the Women Empowerment and Gender Equality Bill was passed by Parliament. The law seeks to introduce measures and targets to strengthen existing legislation on the promotion of women empowerment and gender equality. The President restructured his Cabinet to establish a Ministry in the Presidency focusing on Women, Children and People with Disabilities. The Ministry was later configured to focus on women only. Its mandate is to champion the advancement of women socio-economic empowerment and gender equality in the country. A report from the Ministry of Women in the Presidency estimates that women accounted for 43.8 percent of GDP in 2014, equivalent to approximately R1.3 trillion in 2010 prices. Despite our country's excellent policies and programme intervention framework that supports women's economic empowerment, South Africa continues to experience gender gaps with respect to achieving gender equity in economic transformation. According to a Statistics SA report (2014) there remains significant differences in the participation rates of males and females in the labour force. In addition to low employment rates among females, a large portion of South African female workers remain concentrated in low-skilled and low-paying jobs. Women also bear the burden of doing unpaid work. This economic gender gap is a result of various, and often deep-rooted constraints that women face in taking advantage of market opportunities. In terms of representation, significant progress has been made in reaching gender equity in government institutions over the last two decades. The report further states that this is not the case in the private sector and suggests a need for increased state monitoring and intervention to ensure that the country’s legislative goals of gender equality are achieved. A further Statistics SA’s (2016) Report on Demographic and Health Survey concluded that one in five women experience physical violence. Despite the lack of clarity around statistics reflecting how many women die at the hands of their intimate partners, gender lobby groups have been especially vocal given the information presented in a 2014 SAPS annual report that showed an increase in the number of women murdered. The report also showed that 43,195 rapes were reported that year. Although we have come a long way in achieving gender equality, we still have miles to go. As we ponder on this women’s day, my recommendations are not towards further policy intervention but rather towards you as the reader. What are these deep-rooted constraints towards women that the Statistics SA report refers? Is it our perceptions of gender and hidden biases? I refer to this because we are taught and learn how to behave towards each other as males and females. How our fathers, uncles and brothers treat our mothers, grandmothers, aunts and sisters becomes our ‘normal’ and we will duplicate their behaviours as we mature. This, in my view predominantly shapes our perceptions of who we are and how we relate to one another. Allow me to pose a question to you as the reader? If you are a male, what are your perceptions of women and how does this impact your professional female colleague? Are you stereotyping her? Are you treating her as your equal? What are the behaviours that are intentional? Once you have resolved those intentional behaviours and perceptions, then reflect as to what the unintentional perceptions and behaviours are that may be hindering your female colleague or making it more difficult for her to progress? To the female readers, I have a few recommendations. Firstly, we must be thankful to the women that have gone before us, who paved the way for you and I to obtain an education, to have equal rights, to have the right to vote, etc. Let us not forget that we, as women, were not allowed to participate in many activities that we so freely enjoy today. 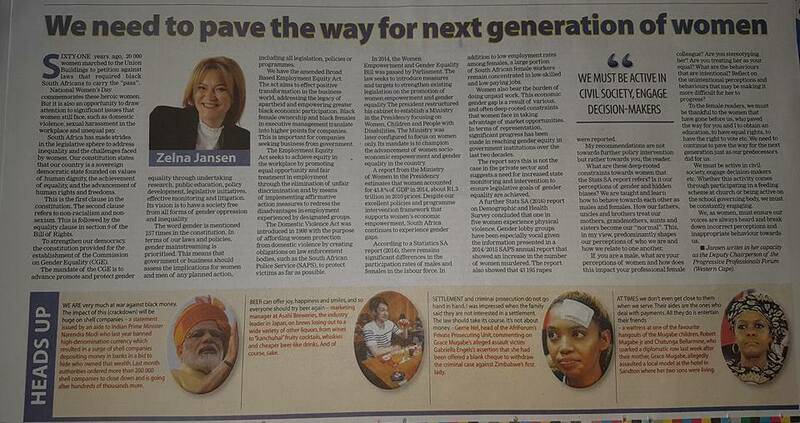 We need to continue to pave the way for the next generation just as our predecessors did for us. We must be active in civil society, engage decision-makers, etc. Whether this activity comes through participating in a feeding scheme at church or being active on the school governing body, we must be constantly engaging. We, as women, must ensure that our voices are always heard and continuously break down incorrect perceptions and inappropriate behaviour towards us.